It's Pizza Friday! It's a thing, right? I've come to the conclusion that it's time to start making two pizzas for my family on pizza night. One just barely feeds everyone, and that's only if I serve a substantial side dish. Or maybe I should just stop making pizzas that are so good that we all inhale an entire pizza in less than 10 minutes? Then maybe Caroline won't cry when she doesn't get seconds because her brothers (and parents) ate the rest of the pizza? .... We'll go with a second pizza. 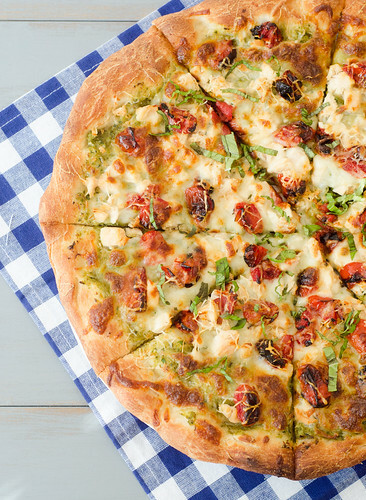 This pizza is a riff on a pesto pizza, utilizing one of my favorite spring veggies: artichokes! I mixed up an easy artichoke pesto, slathered it on the crust, then topped it with plenty of cheese, shredded chicken, and roasted tomatoes. Such a simple combo, but such a great pizza. It was a gorgeous evening, so we carried our dinner outside and ate on the deck. After the pizza was demolished in mere minutes, the kids all toddled around in the yard, and I sat and relaxed with a nice glass of rose'. Life is good in the springtime. Especially with pizza and wine. This will make more pesto than you need, but it is wonderful as a sandwich spread, stuffing for chicken or pork, bruschetta topping, pasta mix-in, etc. Or you could probably freeze it pretty easily and save it for another pizza! Combine all the ingredients except the olive oil in a food processor, and puree until smooth, stopping to scrape down the bowl as needed. With the food processor running, slowly pour 4 tablespoons of the olive oil through the feed tube. Add an extra tablespoon of oil if the pesto still seems thick - you want it to be easy to spread. Taste and season with salt and pepper as needed. On a rimmed baking sheet lined with parchment paper, toss the tomatoes with 1 tablespoon of olive oil, a big pinch of salt, and a pinch of sugar. Turn on the oven to 500 degrees, place a baking stone on the bottom rack, and roast the tomatoes while the oven preheats. Stir them every 5-6 minutes, roasting for 10-15 minutes total, or until they are browned, caramelized, and have released a lot of their liquid. Keep a close eye on them though, because they will burn easily. Remove the tomatoes from the oven and transfer the baking stone to the top rack. Keep the oven on as you prepare the rest of the pizza. Sprinkle a large square of parchment paper with cornmeal, then roll and stretch the pizza dough into a 12-14 inch circle. Brush the outer edge with olive oil, and spread the artichoke pesto in a thin layer in the center. 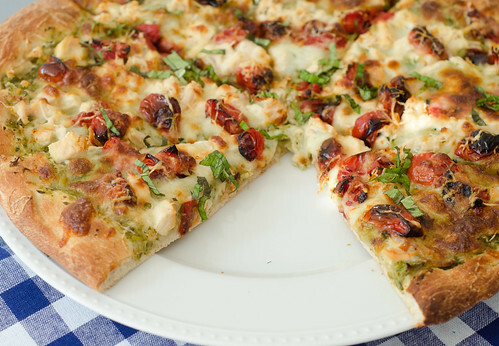 Top the pesto with 1 cup of mozzarella, then scatter the chicken and tomatoes over the cheese. Sprinkle the remaining mozzarella and the parmesan over the top. Carefully transfer the pizza + parchment to the oven and bake 10-12 minutes, or until the dough is browned and the cheese is melted and bubbly. Allow to cool 10 minutes, sprinkle the top with basil, slice, and serve. A dish that I and my family loves to eat, however it is not easy to do. This pizza sounds wonderful. I will be making this pesto soon and eating it on everything. As my family has grown up - now 2 teenage boys, I make a pizza dough using 4 cups of flour and we make 4 pizzas. Everyone gets to top theirs just like they like it. Which for them means pepperoni and for me means a variety of veggies, pestos, cheeses like goat cheese or gorgonzola, whatever mood i'm in. Enjoy pizza night!!!! Beth, that will definitely be the plan when everyone is old enough to top their own pizzas! We do this with my 2 oldest now, and they love it! Now that we do 2 pizzas, I make one "composed" one, and the other is a random assortment of things from the fridge that need to be used up - tonight's was mushrooms, pepperoni, bell peppers, and smoked cheddar! and I meant to say, I used the leftover pesto on a panini with chicken and mozzarella, and it was fantastic! I KNOW this is good. I have made variations of this and was quite pleased with the result. I had a gentleman friend who didn't work out, but one of 'right' aspects of the relationship was introducing me to the yumminess of good pesto. Pizza Friday? Man, I want to spend Fridays at your house! This looks so freaking good I can't stand it! I was going to make the shrimp caprese pizza for OUR Pizza Friday, buuuut this just replaced it. Boom. I always LOVE your pizza ideas!! They make me so excited because the flavor combos are always so original. Like artichoke pesto - whoa! So good.